Pure bliss in every bite! 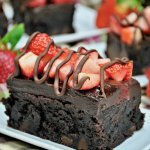 These rich chocolate covered strawberry brownies are the ultimate in decadence! Stir 1 1/2 cups of chopped fresh strawberries in the brownie mix, then pour batter into a baking dish. Try to make sure that strawberries are evenly distributed. Bake at 350°F for 20-30 minutes or until a toothpick inserted in to the middle of the brownies comes out clean. Add chocolate and whipping cream to a double boiler. Whisk together as they melt, until smooth. Scoop 1/3 of ganache into plastic piping bag and cut a small hole in the tip. Set aside. Spread the ganache from mixing bowl over the top of the brownies, then place the rest of your chopped strawberries into ganache. Drizzle the remaining ganache (in piping bag) over the strawberries. Allow to set before slicing brownies.